Engine is a 50 HP Pathfinder diesel engine with Hurth 2:1 V-drive transmission, 1.25” stainless shaft and Martec 17x11 folding propeller. 100 amp alternator with 3 step charging. Marinetics electrical panel. Six deep cycle golf cart batteries form 3 groups of 12v storage. They can be liked together or separated to serve as house, starting, or refrigeration/windlass systems. Heart Interface 2000 Watt inverter; smart battery charger; two solar panels deliver approximately 80 watts. Both masts are one piece Isomat fully anodized aluminum extrusions. The main mast and mizzen are stepped through the deck to give them additional strength. The rig is double spreader with 5/16” forestay, Harken roller furling, and 5/16” backstay splitting to1/4” twin stays with a hydraulic adjuster with a 2:1 purchase. All standing and running rigging is stainless steel with Staylok-Norsemen type fittings. Solid boom vang. Spinnaker pole. Lazy jacks on main. There is a removable midstay with hank on storm jib. The sail inventory consist of a mainsail, 150% genoa, 110% jib, storm jib on self-tacking track, and mizzen sail. The general hull design can best be described as fin keel with skeg hung rudder. Both hull and deck are Airex ¾” closed cell foam with fiberglass on either side. This makes for a very strong and stiff but lightweight boat. The core material is removed along the centerline of the hull to produce a solid fiberglass laminate 1.25 to 1.5” thick. A teak deck was laid over the top of the fiberglass. The hull to deck joint is solid fiberglass and given additional reinforcement by full length toe rails through bolted to the hull to deck joint. The 9000 lb. lead keel is attached to the hull with 1.25” bronze bolts. The interior joinery often doubles as structural stiffening, for example berth bottoms and cabinet faces are often cored fiberglass construction, as are the bulkheads. Watertanks (3) are stainless steel. Diesel fuel tank is integrated with the hull. Holding tank (10 gallons for Lectrasan sewage treatment unit) is integrated with the hull. Note that recently the teak on the decks was removed and re-bedded. This boat is designed in a three cabin configuration with a unique folding bulkhead design which creates a private mid-cabin sleeping space. Enter the interior down a ladder from the aft cockpit. Here you will find an inside steering station, a chart table and storage to starboard, and port side quarter berth which converts to a double berth. Moving forward down two steps enter the main saloon. To starboard is a full galley with ample storage for provisions. The galley stove is a Force 10 four burner with oven. The refrigerator is a Sea Freeze 1/3 hp electric motor driving a ¼ hp compressor with separate holdover plates for the freezer and refrigerator. Opposite the galley is the unique berthing space. You'll find a pilot berth outboard to port, and a settee berth which converts to a double. By folding a customized bulkhead here the space coverts into a private sleeping cabin. Moving forward you will enter the forward saloon. Outboard to port is another pilot berth. An L-shaped settee is to port with a folding table amidships. To starboard is a short settee. A bulkhead heater warms this cabin. Additionally, A 7kw Espar hot water diesel furnace provides heat to all cabins and hot water for the galley and head compartment. Forward through a bulkhead door is the forward cabin. A full head compartment with marine toilet and shower is to port with ample hanging locker space to starboard. The forward v-berth converts into a double berth with an overhead hatch for ventilation and egress. The anchor locker is all the way forward in this space. Interior finish is Honduras Mahogany joinery with light birch accents. Bulkheads are either painted white of have white laminate surfaces, as are the overhead surfaces. The ceilings are tongue and groove Sitka spruce. The cabin sole is teak with birch strips inlaid as non-skid. Nobletec navigation software driven by small book PC. A 20” display at chart table shows boat location and movement via a Lorance GPS receiver, radar information (SiTex), and AIS location of commercial ships. SR Mariner cockpit display shows depth, speed, VMG, wind speed, log. Below deck linear hydraulic drive autopilot. West Marine VHF. Alpine amplifier with two speakers in main cabin, input via PC. The electric pump is a Rule 3500 with float switch and the manual pump is a Gusher 500 mounted in the cockpit. If you've ever wondered what kind of boat a naval architect would build for himself, and how he'd build it, here's an answer. The builder, a naval architect, incorporated many features and build techniques not found in most production boats when he built this boat to meet his own requirements and dreams. And he's owned it and maintained it continuously since. In designing the boat he drew upon considerable experience working with Chance Naval Architects in New York and Gary Mull of Ranger Yachts in CA. His range of experience is with sailboats from 20' to 70', custom designs and production boats. With each of these companies he was involved in the design and build of America's Cup challenge boats. 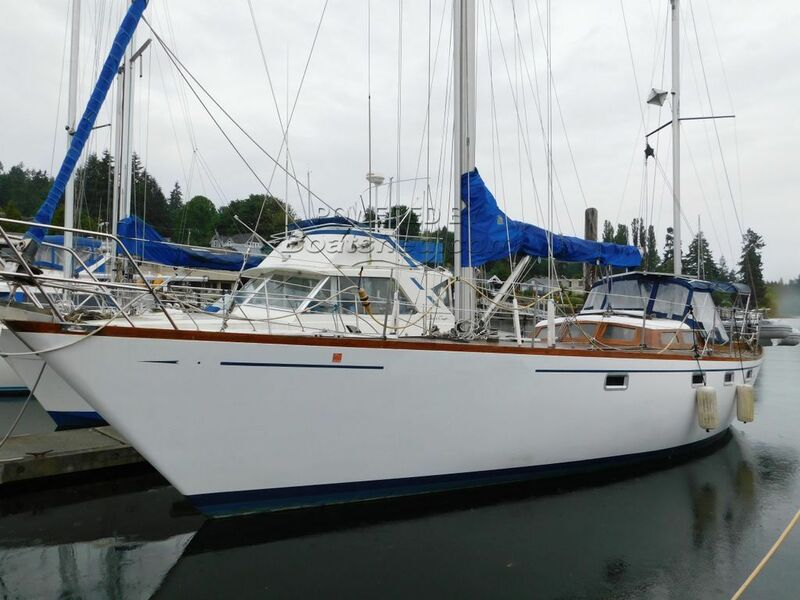 This Luengen 43 Offshore Ketch Pilothouse Liveaboard Cruiser has been personally photographed and viewed by Dave Carleson of Boatshed Seattle. Click here for contact details.